The easiest Slow Cooker Chicken Noodle Soup of all times. It is entirely made in the crockpot and not only for when you’re sick but all cold weather long. Give it a slurp and feel that warmth flowing through your heart and into your belly. Before I get all poetic here, let’s better get right into the details of the recipe. Rule #1 for success: do not, I repeat, do not add the noodles at the beginning. They will not only overcook, they will become absolute mush! There is no pasta in the world that will withstand a 4-8 hour cooking time. Rule #2 for success: add fresh herbs to your slow cooker chicken noodle soup. A soup without herbs and spices is a soup for the sick. Don’t get me wrong, this soup is fabulous when you’re sick, make it with just a bit of salt and that’s it. Wonderful for the stomach. However, if you are not sick, you don’t want the soup to just be good to your stomach, right? You want it to be good for your soul. Add those herbs and if you like it, add some heat. My favorite chili to add is the Peruvian yellow “ají”. Abroad it’s usually sold in Latina American grocery stores in glass jars. Absolutely delicious. If you can’t find ají, add a couple drops of habanero sauce. Rule #3 for success: cut the vegetables into small pieces and shred the chicken into small pieces. The idea is to get a little of everything onto your spoon when you eat it. If your carrot pieces are gigantic you’ll end up eating a bite of carrot and a bite of celery and a bite of chicken instead of a bite of Chicken Noodle Soup. 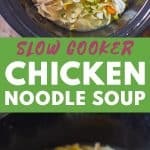 What’s The Best Slow Cooker Chicken Noodle Soup Recipe? The best recipe is always the one that is the easiest to follow, tastes amazing aaaaand nourishes your body! At least that is my opinion and something I strive for in every recipe. With slow cooker recipes this tends to be a pretty easy thing. All you have to do is chop up veggies, throw everything into the pot, set it and walk away for hours. This is one of the few recipes where I actually enjoy slow cooked chicken breast meat. Usually, I save my chicken breasts for sheet pan recipes and pan frying. When completely submerged in a delicious herb infused broth though they come out great. No need for thighs but you can absolutely use skinless thighs. You can even leave the bones in and fish them out later. The bones will give the soup a really nice extra boost in flavor. If you’re a fan of slow cooker recipes make sure you try my Slow Cooker Lemon Chicken. It went viral on Instagram and people are absolutely loving it. So, you hear me talking about a “herb ball” in the video and it’s the most amazing discovery I’ve made this year. No, this is not sponsored, I’ve bought that thing myself at a store and I don’t even remember the brand because I threw away the packaging. I’ve tried to find it on Amazon but I couldn’t find the one I have. There are tons of others though that I’m sure work just as fine. You can choose one of many. They turned out to be called herb infuser. Not herb ball, lol. (that’s an affiliate link and I earn a small commission if you buy through the link, at no extra cost to you). Absolutely in love with that thing. It saves sooo much time having to find the stalks of the herbs and it adding fresh herbs as opposed to dried makes all the difference in this soup. 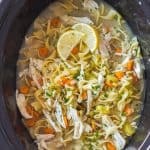 Does Crockpot Chicken Noodle Soup Freeze Well? If freezing without the noodles yes, if freezing with the noodles no. Pasta soaked in broth does not defrost well. It overcooks when you reheat the noodle soup. So the Slow Cooker Chicken Noodle Soup doesn’t even go well in the fridge for leftovers the next day. Unless, you keep the noodles separate. If you know you won’t be able to finish the whole pot in one day or if you know you’re going to want to freeze some. I recommend cooking the noodles separate in a regular pot and then add to each individual plate and then ladle the chicken soup on top. Don’t add the noodles to the broth so you can freeze the broth alone. The broth with vegetables and chicken freezes super well and also holds its shape and flavor when defrosting and reheating. 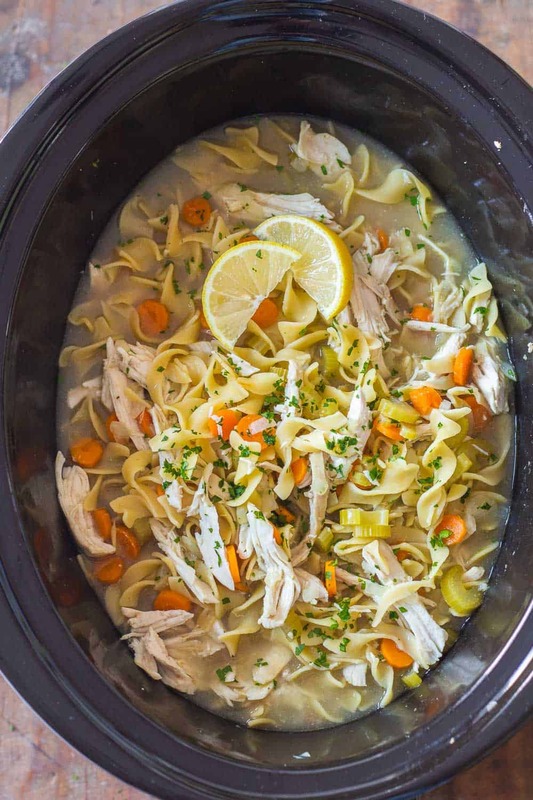 The easiest Slow Cooker Chicken Noodle Soup of all times. It is entirely made in the crockpot and not only for when you're sick but all cold weather long. 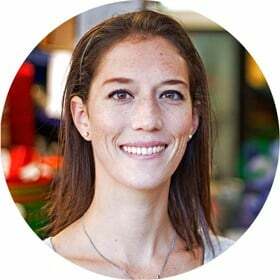 chili (optional - my favorite is "ají amarillo" or "habanero sauce"
Add chopped onion, crushed garlic, chopped vegetables, chicken breasts and broth to your slow cooker. Add the herbs just like that or use a herb infuser for easier removal later. Don't add any salt or pepper at this point, your broth might be seasoned enough. Set the slow cooker to 4 hours on high or 8 hours on low. 10-15 minutes before serving, remove the chicken breasts and add frozen peas and egg noodles (or any other pasta) and set on high to cook pasta until al dente. The time will depend on the type of pasta. Anywhere from 7-15 minutes. Keep an eye on it to not overcook. Shred the chicken with two forks and once the pasta is cooked add back into the slow cooker. Give it a stir and then give it a try so you can adjust seasoning at this point. This is where you want to add salt and pepper and chili if using to taste. Serve immediately and sprinkle with freshly chopped parsley.